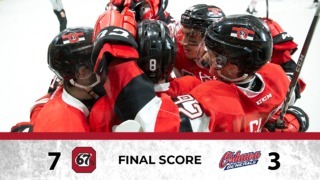 The Ottawa 67’s sent the crowd home happy on Saturday afternoon, putting an exclamation point on the Throwback Game with a thrilling 5-4 overtime win over the Niagara IceDogs at the Arena at TD Place. In front of 6,330 fans — the highest turnout of the year, other than the School Day Game at Canadian Tire Centre — chowing down on Throwback-priced $1 hot dogs, popcorn and pop, Artur Tyanulin played the hero, scoring his 18th of the year 2:27 into overtime to give Ottawa its second-straight victory. It was a fitting end: a highlight reel goal scored at a rink steeped in tradition, with former players like 1999 Memorial Cup winners Henric Alfredsson, Dan Tessier and Matt Zultek, along with legendary former Head Coach and GM Brian Kilrea, dropping the ceremonial faceoff. They were joined by fellow former 67’s Thomas Nesbitt, Chris Despatis, Steve Zoryk, JF Perras and Lou Dickenson. The game needed extra time after the teams traded goals in the first and second periods before Niagara jumped ahead 4-2 with eight minutes to play. A minute after the IceDogs’ fourth goal, Jared Steeged closed the gap for the 67’s before defenceman Noel Hoefenmayer added his ninth to tie things up. After a tight first period that ended with the game knotted at a goal apiece, it was more of the same in the second. 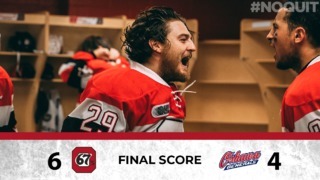 Once again, Ottawa struck first and early as Travis Barron scored his ninth of the year four minutes in as the 67’s captain blasted a short-side slap shot to restore his team’s lead. Less than three minutes later though, Daniel Singer scored for Niagara to send the teams into the second intermission tied 2-2. Under the watchful eyes of players representing so much Ottawa junior hockey history, the modern day 67’s wasted little time getting on the board in this one. The alumni hadn’t even taken their seats following the ceremonial faceoff when Mathieu Foget banked in a shot for his second of the year just 14 seconds into the game. That lead would last until just past the midway point of the period when Johnny Corneil potted his 20th of the season at the 11-minute mark to tie things up. The overtime win vaults the 67’s back into sixth place in the OHL’s Eastern Conference, a point up on Sudbury and four behind fifth-place Hamilton. 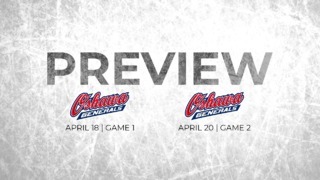 The 67’s extended home swing continues on Saturday, Feb. 4 as Ottawa hosts the Erie Otters at Canadian Tire Centre at 2 p.m.